Goose Creek, Pelly, Wooster Tri-Cities became Baytown! Goose Creek was the name of a Post Office located in a store in what was known as Old Town (Texas Avenue area) and was physically moved by the inhabitants of New Town, so they could name their city Goose Creek. Oil was discovered in 1908 at the mouth of Goose Creek and Tabbs Bay and became known as the famous Goose Creek Oil Fields. 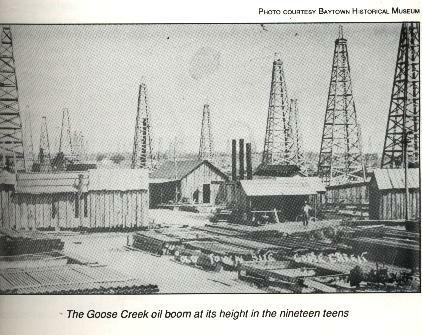 The Goose Creek Oil Field became the first off-shore oil drilling in the state. Goose Creek was 2 miles from Baytown (Lee College area) and separated from Pelly by the Southern Pacific Railroad Tracks and a drainage ditch. Confederate Naval Works of Goose Creek was established in the 1850's by brothers Captain Henry Chubb and his brother Henry. Possibly 6 ships were built here and used to support the South in the Civil War. Read about it here! Houses in New Town had to be constructed of brick, or stucco. Plots of land were well laid out by Ross S. Sterling, a Chambers County store owner. Goose Creek incorporated in April 1919. It's business district was the hub of the Tri-Cities and was the Texas Avenue area. In 1928, the city of Goose Creek covered only three-fourths of a square mile, but had a population of 5000. In March 1947, after a census was taken of Goose Creek (9,928), the city folded into Pelly/Baytown (11,030) and officially ceased to exist and took the name Pelly. The first Mayor of Goose Creek was C. Q. "Kid" Alexander. See the photos of Goose Creek here! The Brunson theater and the Decker Drive-In were both owned by local merchant Howard E. Brunson. Long before incorporating as a city and becoming a part of the Tri-Cities that included Pelly and Baytown, it was known as Goose Creek. Proof is in a letter written in 1836 by Dr. Harvey Whiting, who gave his address as Goose Creek. Published a century later in the La Grange Journal, the letter was written to Col. James Morgan about two weeks after the battle at San Jacinto. Whiting wanted to tell his side of the story in regard to a brief but desperate trip to Morgan’s Point to consult with Mexican Army Gen. Santa Anna and Col. Juan Almonte. Before the battle at San Jacinto on April 21, 1836, the Mexican troops headquartered at Morgan’s Point. You may know that story. While Morgan was on military duty in Galveston, fortifying the island for a possible invasion, the Mexican Army invaded his own turf. Before they left, the troops cleaned out Morgan’s warehouse, taking enough provisions to last a war time. Moreover, Gen. Santa Anna added Morgan’s pretty housekeeper Emily West (a.k.a. Emily Morgan, the Yellow Rose of Texas) to their caravan. Worried about the safety of his family, Whiting decided to row his boat over to Morgan’s Point for a little talk. All he wanted from the Mexican Army was assurance his family would be safe. FYI, Whiting’s home and medical office were located in the vicinity of present-day Bicentennial Park. All of that land later acquired by the Pruett family – including the old oak tree on Texas Avenue -- originally belonged to Whiting. After Santa Anna promised not to kill his family, Whiting returned home to Goose Creek. Mission accomplished. However, there were repercussions. Rumors began to circulate that Whiting was in cahoots with the Mexican Army. His loyalty was questioned, especially by rabble-rouser David Kokernot, who called Whiting an old thief – and even worse, a Tory! Though he never fought in the Texan Army, Whiting did his part for the war effort. Risking his life, he went to Lynchburg to save important documents from the home of Republic of Texas President David G. Burnet. He may have been a pacifist, but he was neither a thief nor Tory. In his letter to Morgan, he aimed to make all that clear. Until researching the history of the Tri-Cities the other day -- prepping for a story about the 97th anniversary of the city of Goose Creek -- I didn’t know an entire community went by that name long, long ago. In my history files in a folder labeled city of Goose Creek, I had overlooked a faded newspaper clipping from the Houston Chronicle describing the Whiting letter, dateline Goose Creek, May 3, 1836. Houston Wade, a Houston Chronicle reader in 1937, provided that newspaper with information from the La Grange Journal about the Whiting letter. He was responding to a story in the Chronicle by Chester Rogers about the origin of the name Goose Creek. Rogers had written that Indians roaming this area named the stream Goose Creek. The Indians really started something – didn’t they? Their designation for a stream inspired the naming of a settlement, then a city, hospital, school district, country club, myriad business places and most recently, Goose Creek Memorial High School. What’s in a name? In the case of Goose Creek, a whole lot of local history. The late Dr. Richard Woods wrote an inspirational book about how to make friends -- the subject of Wednesday's column -- but, as far as I know, the retired Baytown dentist never authored a book about local history. He could have. Having grown up on downtown Texas Avenue where his father, John Lynn Woods, owned a pharmacy, Dr. Woods was an eye-witness to Baytown history long before this entire city was known as Baytown. The original, incorporated Goose Creek claimed Texas Avenue, and the Woods pharmacy was called the Goose Creek Pharmacy. Goose Creek represented part of the Tri-Cities along with incorporated Pelly and unincorporated Baytown. The Woods business stood at 126 W. Texas across the street from a competitor, Herring's Drug Store, owned by Garrett Herring. John Lynn Woods, drawn by reports of the oil boom in the Goose Creek field, moved to Pelly in 1917 and set up shop. With the city of Goose Creek thriving in commercial and residential development, Woods decided in 1925 to relocate his pharmacy to Texas Avenue. Dr. G.A. Lillie of Goose Creek and Dr. John Bevil of Beaumont were his business partners until he bought them out. Richard Woods helped his father at work and his mother at home by running errands, first riding over the Tri-Cities on his bicycle and then driving the family car at the age of 8. That's right - 8. Once, when I was quizzing him about local history, he described his father's place of business. He said round tables filled the center of the building all the way from the front to the back where the drug department was located. There were old-style chairs, the type seen today in some ice cream parlors. Ceiling fans whirled above the tables to keep the customers cool. A fire in 1935 and another one in 1940 destroyed the building but following each fire, the drug store was remodeled and modernized. Eventually booths replaced the tables. In addition, customers had the option of bar stools at the lunch counter. Complete meals were served, and Dr. Woods even recalled the price. For 25 cents, a customer could buy a meal consisting of a meat, three veggies, a drink and dessert. Later, when the price was increased to 35 cents, customers complained. Dr. Woods also remembered a young man who ran the lunch counter in the early years. That would be Harold Scarborough, who went on to become a successful pharmacist and owner of his own business, lastly on Market in old Baytown. John Lynn Woods opened his drug store door every day at 7 a.m. and locked up at 10 p.m. In addition to filling prescriptions throughout the day, he managed the whole store and kept the books with a quill-type pen. Dr. Woods, continuing his review of downtown in the old days, said Culpepper's Furniture Store occupied the northwest corner of Texas and Ashbel. The second floor of the building housed a hospital manned by medical doctors William Brooks, C.H. Langford and L.A. Hankins, who later built the Goose Creek Hospital on West Defee next to the Del Monte Hotel. Just south of Culpepper's on Ashbel was Dr. N.L. Dudley's ear-nose-throat clinic and hospital. Dr. H.I. Davis eventually bought this structure and practiced there for many years. East of the Goose Creek Pharmacy was the American Barber Shop, Dr. Woods said, noting that the late Dr. Herbert Duke came for his shave at 8 a.m. every morning, administered by a barber named Duke Jones. Lillie-Duke Hospital, at West Pearce and Ashbel, was owned by Dr. Duke and John Lynn Woods' former business partner, Dr. Lillie. GOOSE CREEK OILFIELD. The first offshore drilling for oil in Texas occurred along Goose Creek in southeast Harris County, twenty-one miles southeast of Houston on Galveston Bay. In 1903 John I. Gaillard noticed bubbles popping to the surface of the water at the point where the creek empties into the bay. With a match he confirmed that the bubbles were natural gas, a strong indication of oil deposits. Royal Matthews leased the Gaillard property and drilled for 2½ years but could not bring in a continuously producing well. Not until a Houston-based syndicate, Goose Creek Production Company, drilled on the marsh of the bay was oil found, on June 2, 1908, at 1,600 feet. On June 13 the Houston syndicate sold out to Producers Oil Company, a subsidiary of the Texas Company. After drilling twenty dry holes in two years they abandoned the field. The American Petroleum Company, new holders of a lease on Gaillard's land, finally drilled close to the shore. On August 23, 1916, contractor Charles Mitchell brought in a 10,000-barrel gusher at 2,017 feet. Initially the well produced 8,000 barrels daily, a quantity indicating that Goose Creek was a large oilfield. The community changed overnight as men rushed to obtain leases, drill wells, and build derricks. Tents were everywhere, teams hauled heavy equipment, and barges brought lumber and pipe from Houston. Within two months the well leveled off to 300 barrels a day, but by December 1916 drilling along the shores of Goose Creek, Tabbs Bay, and Black Duck Bay had raised production to 5,000 barrels daily. The flow of the average well drilled in 1917 was 1,181 barrels a day. The largest well of the field was Sweet 16 of the Simms-Sinclair Company, which came in on August 4, 1917, gushing 35,000 barrels a day from a depth of 3,050 feet. This well stayed out of control for three days before the crew could close it. World War II oil prices of $1.35 a barrel encouraged Humble Oil and Refining Company and Gulf Production Company to try offshore drilling. The Goose Creek field reached its peak annual production of 8,923,635 barrels with onshore and offshore drilling by 1918. In 1917 Ross S. Sterling a founder and president of Humble Oil (now Exxon, U.S.A.), bought the Southern Pipe Line Company to route oil from the field to the Houston Ship Channel Two 7,000-foot lines of four-inch pipe crossed Black Duck Bay storage tanks and a wharf on Hog Island in the channel. Since Goose Creek oilfield was a prospective long-term producer, Humble constructed its major refinery, which was completed by April 21, 1921, adjacent to the field and named the plant and townsite Baytown. The Dayton-Goose Creek Railroad Company, built in 1918, connected the refinery to the Goose Creek field. The Goose Creek field is a deep-seated salt dome with overlying beds slightly arched; its discovery spurred exploration for deep-seated domes, and led to the discovery of some of the largest oilfields in the United States. Production declined from 1918 until 1943, when it was only 388,250 barrels; 2,146,450 barrels was produced in 1965. Principal operators in the field in 1984 were Exxon, Gulf Oil, the Monsanto Company, Coastal Oil and Gas Corporation, and Enderli Oil. The total production of the field in 1983 was 366,225 barrels. The first Gaillard well and the Sims Sweet 16 were still producing in 1984. In 1990 the field's 192 wells produced 742,934 barrels. Total production of the field's lifetime stood at 140,644,377 barrels. Some of the information on this page comes from the excellent book 'Baytown Vignettes', or 'The History of Baytown' available at Sterling Municipal Library and the Baytown Historical Museum located at 220 W. Defee. Copyright © 2000 [OurBaytown]. All rights reserved. Revised: September 11, 2018 .